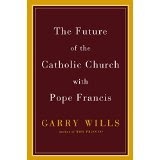 I have to admit a propensity to read and consider the thoughts of that particularly difficult (Catholic) historian, Garry Wills. Oddity of oddities, sometimes I’ll read a chapter or two of his while listening to Immaculate Heart Radio. Anyway, the near simultaneous release of Will’s latest book and the surely magnificent tome of Fr. Samuel Weber’s English Propers presents an interesting notion as well as coincidence: is Anglophone Catholicism conceding the “universality of Latin” argument by attrition? Will’s first premise in his “Future…” centers around contentions about the conditions (well documented) by which Latin was promulgated as the sacral language initially and its evolution as a binding agent well into the 21st century. Of course, his position isn’t in concert with the magisterial dialectic through the course of centuries of official consideration and examination. 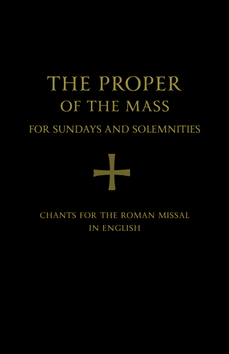 But one has to ask if many of our most ardent proponents of the reinvigoration of the use of Latin chant and the restoration of the Propers are essentially conceding the argument (echoed by Wills’ characterization) of the principal place provided Latin Chant ratified via Vatican II and resuscitated by Summorum Pontificum? Let me be compassionately blunt: What exactly does this mean, in plain English? If Jeff Ostrowski is trumpeting the Weber Propers as the closest kissing cousin to the GR/GM/GS aesthetically, on top of every other volume that&#039;s come out in the last decade, how does that jibe with the argument that the CSL in point of fact encouraged the continued usage of Latin as THE sacral language of the Universal Church? I know I&#039;m not a liturgical theologian, Richard, but at what point does the pontoon bridge become a steel span bridge connecting the highways? And I am wrong to say &quot;Anglophone Catholicism.&quot; These propers are valid only under USCCB&#039;s GIRM. If I&#039;m missing something, explain it to me like I was a four year old. Sorry, I&#039;m still not clear what you&#039;re arguing for here. I&#039;m sure Fr. Weber has produced something admirable, not to mention timely and refreshing. Whether &quot;aesthetically&quot; they compare to the received corpus of Gregorian chant they are meant to image… well, I doubt Fr. Weber would claim that, or Mr. Ostrowski, if pressed. The value of any of our modest modern efforts in this area must face the test of time and liturgical tides. Not one of us envisions writing THE Graduale for the English-speaking Church. In the first place, there&#039;s that premise: just what the heck is this English-speaking Church, vis. the Universal Church? As far as I can tell, it is an intellectual construct that has no basis in reality, except, perhaps, for those benighted congregations that, actually or spiritually, have already separated themselves from our Holy Mother. From that perspective, the language of one&#039;s Propers matters not a damn. Ha, I didn&#039;t know &quot;damn&quot; could be part of a four year old&#039;s vocabulary! And I definitely don&#039;t mean to cause offense or irritation. I&#039;m really not arguing here, just observing. And I suppose the topic is a beaten horse in that the universe of the vernacular Church is not that of the Latin/Roman Catholic (Usus antiquior) Church. Your succinct and ironic question sums it up for me: &quot;just what the heck is this English-speaking Church, vis. the Universal Church?&quot; I&#039;m not sure at all. Next PostNext Viva la Revolucion! Sts. Simon and Jude represent!